It's midnight and what are you doing? Normal people are sleeping (I just wish I could sleep!) I, however, am standing in the middle of a chocolate covered kitchen, trying to remember how to work the ice cream maker I found in the basement. S's favourite food is ice cream. 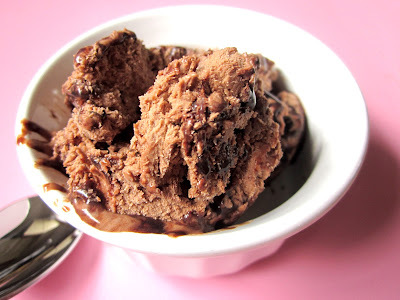 After finding my ice cream maker (a very exciting birthday present for 19-year old me) hiding in a dusty box in the basement, I decided I should spend some time creating the quintessentially perfect chocolate ice cream. I haven't been doing much wedding planning lately, so making fabulous ice cream seems like a good solution. The worst thing about this ice cream is that it is perhaps too creamy. Slightly too delicious. So yummy, in fact, that it was difficult to eat more than a very small bowl at a time. 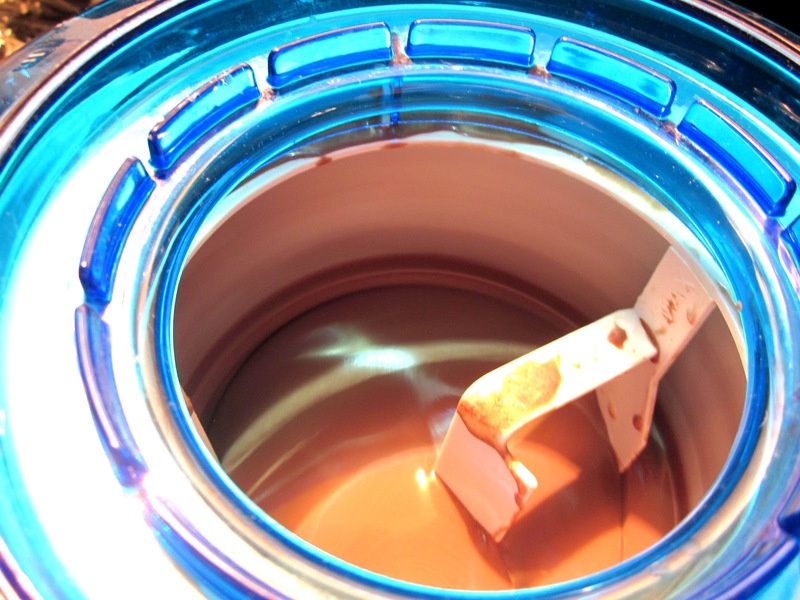 Mix together sugar, milk, salt and cocoa powder in a saucepan and heat at medium-low heat. Stir often. Beat together egg yolks in a separate bowl. Slowly add about 1/2 cup of hot milk mixture, stirring vigorously. Gradually add eggs back to saucepan. Heat and stir, slowly adding 1/2 cup of whipping cream. Stir frequently until mixture is thickened, but be careful not to let it boil! Once mixture is thickened, remove from heat and add the chocolate chips to the hot mixture. Stir until chocolate is completely dissolved. Store in refrigerator until cool, at least four hours or overnight. Once completely cool, stir in remainder of whipping cream and teaspoon of vanilla. Mix together sugar, corn syrup, water and cocoa powder in saucepan. Heat over medium heat until bubbling, stirring constantly. Continue to cook at a low boil for 3-4 minutes. Stir often. Remove from heat, stir in vanilla, and cool thoroughly. Once both mixtures are cool, pour ice cream mixture into ice cream maker and follow manufacturer's instructions. Mine took approximately twenty-five minutes to freeze sufficiently. The ice cream mixture should be like a very thick, partially frozen soup. Use a large spoon to layer partially frozen ice cream mixture and cooled fudge mixture together in a plastic tupperware for freezer storage. Place container in freezer for 8 hours or overnight.